​This is a shorter tour experience suitable for visitors who are staying at hotels close to Auckland International Airport. This unique Auckland walk essentially showcases the Manukau Harbour and surrounds where the famous Tainui waka (canoe) was carried by hand across the Tamaki isthmus (present-day Auckland) and onto the Manukau harbour before travelling south along the west coast of the North Island. 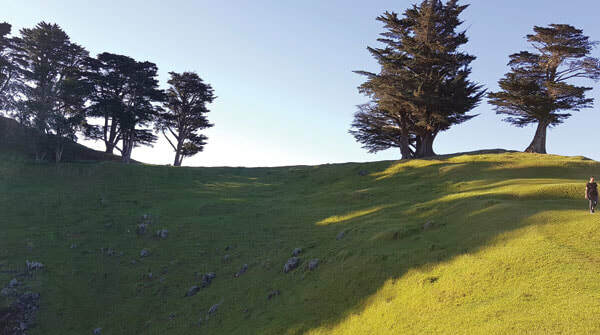 A guided tour will take you to a preserved ancient volcanic mountain (maunga) which will reveal its deep volcanic cone and many other archaeological features including kumara pits, garden terraces, walled garden mounds and stone boundary walls which you can walk around while also experiencing the stunning views. You will visit the shores of the Manukau harbour and see solidified lava rock deposited by Mangere Mountain (Te Pane o Mataoho) approximately 18,000 years ago, the local old Mangere Bridge, a favourite fishing spot used by the locals, and other areas of interest including one of the oldest stone churches in New Zealand, St James Anglican Church. Enjoy genuine Kiwi hospitality with a visit to the local winery Villa Maria, one of New Zealand’s award-winning winemakers, where you may wish to purchase a NZ wine to take home. Alternatively, purchase fresh fish and chips from the local township and relax amongst the gnarly Pohutakawa trees considered the NZ Christmas tree next to the Manukau Harbour foreshore.